Whenever I see fennel in our High Ground Organics CSA and at the farmers' markets, I know that it must be Spring! I use fennel in place of onions whenever I can. This is a mostly hands-off veggie side dish that is amazing in taste and texture. Did I mention 'hands off'?? It was the perfect addition to our Spring table. I like to serve these on a platter with my Butter-Braised Radishes over Little Gems. 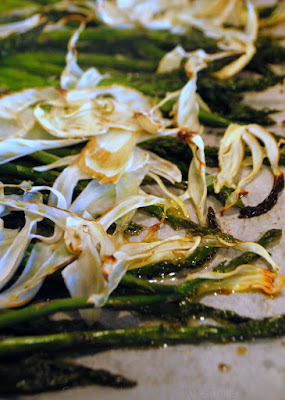 Snap off the last inch of the asparagus stem and discard - or save for a veggie stock. Lay your asparagus on a parchment-lined baking sheet. Lay shaved fennel on top of the spears. Drizzle with olive oil and sprinkle with flake sale and freshly ground pepper. Roast for 20 minutes. That's it! 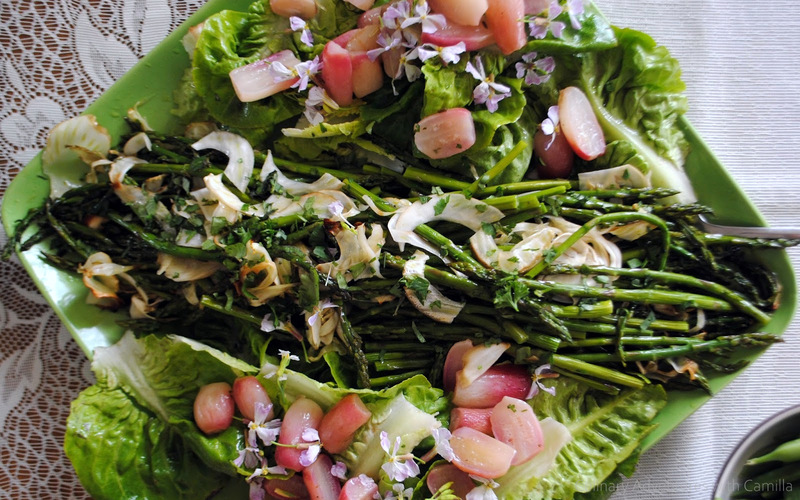 Delicious Spring-y goodness. 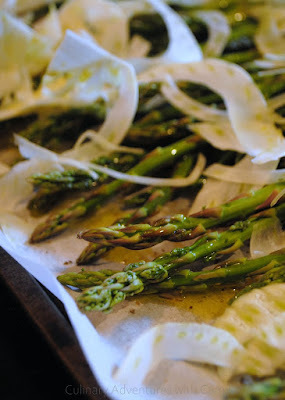 Roasted asparagus is one of my favorites. Never thought to add fennel to it. I'm sure it's amazing. Can't wait to try it. Love roasted asparagus anyway, will have to pick up some fennel to try with it. Roasted asparagus is one of my favorite things. I've never tried fennel though! That shaved fennel is such a pretty touch!